When the people of Flint, Michigan, turned on their faucets in April 2014, the water pouring out was poisoned with lead and other toxins. Through a series of disastrous decisions, the state government had switched the city's water supply to a source that corroded Flint's aging lead pipes. Complaints about the foul-smelling water were dismissed: the residents of Flint, mostly poor and African American, were not seen as credible, even in matters of their own lives. It took eighteen months of activism by city residents and a band of dogged outsiders to force the state to admit that the water was poisonous. By that time, twelve people had died and Flint's children had suffered irreparable harm. The long battle for accountability and a humane response to this man-made disaster has only just begun. 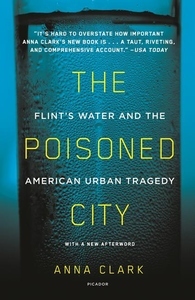 In the first full account of this American tragedy, Anna Clark's The Poisoned City recounts the gripping story of Flint's poisoned water through the people who caused it, suffered from it, and exposed it. It is a chronicle of one town, but could also be about any American city, all made precarious by the neglect of infrastructure and the erosion of democratic decision making. Places like Flint are set up to fail--and for the people who live and work in them, the consequences can be fatal.